Sharing Super Sam with Barnes and Noble readers. 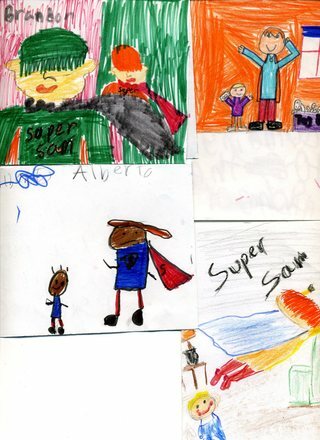 To enjoy a reading of Super Sam by a Super children's librarian, click here. Toddler Petey hardly seems to care that his older brotherSam has taken his blankie to use as a cape to become Super Sam! To the contrary, Sam is Petey's hero. But when Sam inadvertantly hurts his little brother, can he really save the day? Fresh and adorable child-like illustrations perfectly match the lively, spare text. A sweet tale of sibling love and compassion. With the repetitive refrains, children will learn to read without even realizing that is what they are doing. Brief text and bright, bouncy illustrations combine to create an appealing, if slight, story. 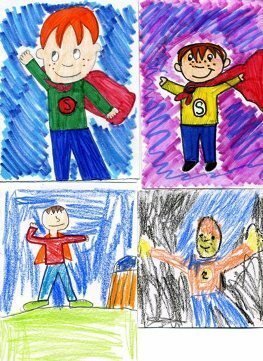 The plot is simple: sturdy preschooler Sam borrows his baby brother's blue blankie and ties it around his neck to become "Super Sam." Everyday objects are transformed as he leafs over tall buildings (a pile of pillows), lifts a (toy) truck into the air, climbs a cliff (a bunk-bed ladder), and escapes from a wild bear (a stuffed teddy). Baby brother Pete is most impressed until Sam accidentally steps on his finger. When neither truck nor teddy soothes Pete's pain, Sam generously gives up his cape. Ries tells the story in short sentences, using only 53 words, including 12 repetitions of the phrase "Super Sam." Rama's illustrations, executed in colored pencil, water-soluble crayon, and watercolor, have a childlike appeal. Round-headed kids with simply drawn features cavort in a vividly colored bedroom. There's some inconsistency in the backgrounds, but this doesn't really detract from the illustrations' energy and charm. Imaginative and fun, Sam's antics will amuse and possibly inspire young listeners. This seemingly unassuming slice-of-sibling-life tale is actually a little gem - a model of sunny storytelling economy with nary a false step. Redheaded Sam (who looks to be age 5 or 6) appropriates his toddler brother's blanket for a cape and transforms into Super Sam (the hero's name is always rendered comics-style, in all-caps bold type). Utterly captivated, little Petey (named in a portrait drawn by Sam) pads around the house behind his big brother to witness his amazing displays of superpowers. "Show your strength, Super Sam!" proclaims newcomer Ries's text, as Ramá (Cheer Up) depicts him exuberantly hoisting a toy truck over his head while Petey looks on in open-mouthed wonder. But when Petey gets a boo-boo and won't stop crying, Super Sam's powers seem all for naught - until he realizes that maybe his "cape" needs to be used for its originally intended purpose. "Super, Sam," reads the closing text in simple font, as Petey blissfully envelops himself in the blanket's comfort. Ries's concise, exclamatory lines are a perfect match for Ramá's buoyant, tightly focused watercolor-and-crayon illustrations (the way textures add a nifty, kid-style touch). With just two dots and an arc for Petey's facial features, Ries expresses everything there is to say about a young sibling's adoration and a big brother's protectiveness. Super Sam! by Lori Ries is a funny story of two brothers with a minimum of text. Sam is the oldest, and, with a blanket as a cape, becomes Superman. Kids will love the way he accomplishes all the feats of heroism. He can fly by jumping off a chair into a pile of pillows in a stack. When enthusiasm carries Sam away, and he steps on his little brother's finger, and the tears flow. Can Super Sam save the day? He tries several items to help, but, finally, when he whips off his "cape," the blanket he was wearing saves the day. We leave Super Sam! with smiles all around. Neon-colored cartoons done in pencil, crayon, and watercolor chronicle the imaginative indoor play of a boy and his toddler brother. Petey shadows Sam, who wears a blankie cape, "flies" around the room, lifts a (toy) truck over his head, and saves his sibling when the child's finger is injured. Full spreads with minimal text, often repeating "super Sam," invite beginning readers to try this book on their own. A cozy tale of brotherly affection. If ever there was a book that proved the thesis "Less is More," this is it. The author and the illustrator manage to tell a complete story with just fifty-three words and a series of simple, bright illustrations. The story is narrated by a toddler, describing the many fabulous feats accomplished by his big brother, Super Sam. Super Sam ties the baby's blanket around his shoulders like a cape and proceeds to fly (from a chair onto a stack of pillows), show his strength (hoisting a toy fire truck above his head), climb a cliff (all the way to the top of the bunk bed), and a series of other miraculous achievements. But when he accidentally steps on the toddler's finger, Sam's super powers are really called into play. The book with humor and insight dramatizes a younger child's hero-worship for an older sibling. Preschoolers who are wishing the new baby would go back to the hospital will undoubtedly enjoy reading it again and again.